Financial wellness, despite its name, is not really about how rich you are. Security concerns everyday money management. Do you have enough money coming in on a regular basis to pay the bills? Are you aware of how you spend – what’s a want and what’s a need? Security also concerns coping with financial shocks such as a drop in income or an unexpected expense. Can you draw on a source of credit? Have you put aside money for a rainy day? Do you have insurance? Freedom is about being able to make choices that allow life to be enjoyed. For example, can you afford to take time off for a holiday? Can you upgrade your phone? It could be expressed another way too: not being forced to forego an expense, especially an everyday essential expense. 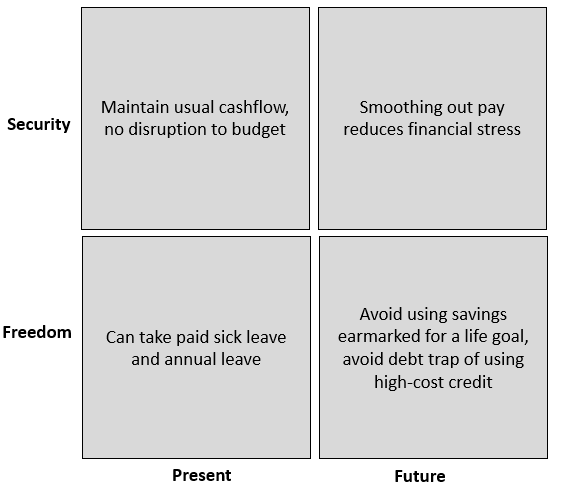 Freedom is having the confidence to manage all of the above and still having the capacity to fund major life goals, such as buying a house or retiring on a decent income. Pay is an input that’s set by another party (your employer). Other inputs are dependent on what the market has to offer – credit services, for example. 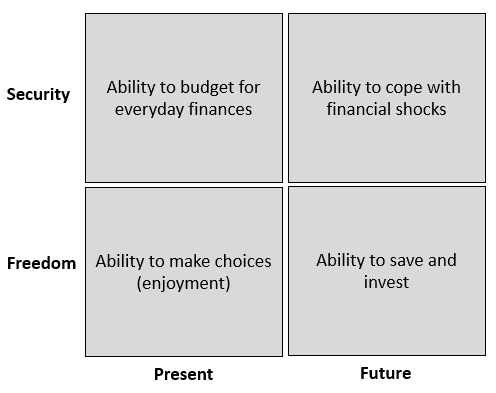 But there are two inputs which you can take ownership of – financial literacy and spending / saving behaviour. Financial literacy is about knowing how to budget, knowing what’s on offer, knowing the consequences and trade-offs of a financial decision. A low level of financial literacy results in poor spending / saving behaviour. Improving your financial literacy, at the very least, makes you aware of how you can improve your spending / saving behaviour. A great way to start is to check out organisations like Step Change, National Debtline, Citizens Advice and Money Advice Service. They offer a range of money management toolkits and provide tailored advice for those overwhelmed by debt repayments. They’re independent and free! Using comparison sites is another easy way to improve financial literacy as they provide insight as to what’s on offer. Popular sites include Money Saving Expert, Money Facts, Which, Go Compare and Money Supermarket. Check for breadth and consistency of results by using multiple sites. If you’re into tech, there are apps for analysing spend, managing budgets, finding savings and making investments. Money Dashboard, Emma, Yolt, Chip, Squirrel, Plumb, Moneybox – to name some. This is where SteadyPay can help. We provide a service designed for those paid by hour – when less than usual pay is received, we advance money (interest free) to bring the pay back up to usual. These pay top-ups have been designed around the financial wellness themes discussed above.